Niagara Falls is a Family friendly area. Bring the family with you and let them enjoy the attractions while you attend the EXPO. With so many things to see and do the hardest thing for the Family will be fitting everything into the itinerary. From year-round attractions to signature events to the natural wonder of the world, Niagara Falls has something for everyone (and at all price points). To help plan your perfectly customized trip, Niagara Falls Tourism has a variety of resources to help you prep. Visit niagarafallstourism.com for copies of maps and guides, and check out the library of virtual reality Niagara Falls experiences. This site also has resources like ‘what to wear’, the local weather and currency exchange information. What’s best? You can purchase tickets and packages straight from your computer or mobile device! This Visitors Guide highlights different ways to experience Niagara Falls. Whether you are planning to visit Family Attractions, have the thrill of a Group Adventure, or share a Romantic Escape for two, the guide shows you different ways to indulge in an experience of a lifetime! Our free Shop and Dine Guide publication is a quick reference to the local eating scene - featuring Celebrity chefs, mouth-watering cuisine and stunning table views. Looking for that special souvenir? All of the best local shopping areas are included so you can take that special memento home with you. The Map of Niagara Falls will help you navigate your trip, as it plots transportation route, attractions and restaurants so you can get a sense of what’s nearby. Falls Avenue Resort: attractions are attached to the Sheraton Hotel property. One of the “7 Wonders of the World”. and take in its indescribable beauty and the breathtaking views. Experience the thundering roar, awesome power and amazing mist of the mighty Niagara Falls! View the American Falls, Bridal Veil Falls and the mighty Canadian Horseshoe Falls up close & personal. Boats sail every 15 minutes in season. You will spend 45 minutes learning about the history and geology of the majestic Niagara River, and experiencing the excitement of playing in class 5 whitewater rapids. We don't want to give away too much about the trip, but we can assure you that it will be one of the most refreshing and memorable experiences of your visit to Niagara Falls! Arrive on-site 45 minutes prior to your departure time so that each member of your group can fill out a participation agreement and attend a mandatory pre-trip safety orientation. Please check the website for more detailed information and safety requirements. Although the Whirlpool Aero Car travels between two points on the Canadian shore, riders of this historic cable car actually cross the international border line between Canada and the United States a total of four times each trip due to the way the river elbows. 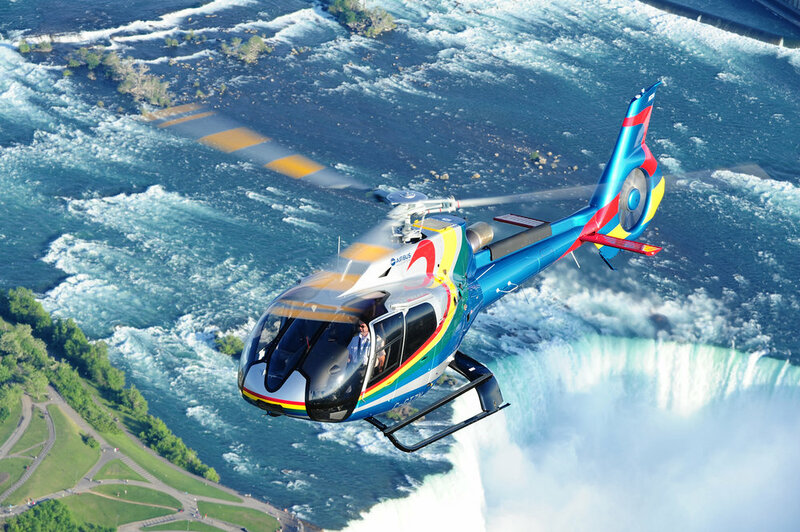 Niagara Helicopters Limited has over 50 years of service, with experienced pilots and courteous ground crew to ensure your comfort and safety. Our air circulated, customized and meticulously maintained helicopters feature individual headsets with taped commentary. Flights depart daily, 9 am until sunset, weather permitting. 70,000 square feet of fun located in the heart of Clifton Hill. Boasting over 300 games, Wild West Coaster and Ghost Blasters Dark Ride! The Great Canadian Midway entertainment complex is always a family favourite for people of all ages! From old favourites like Skee-Ball and Roll-a-Ball to new hits like Super 21 and Deal or No Deal, there is something for everyone. And, when you play the redemption games you’ll be rewarded with tickets that you can redeem for terrific prizes. As one of the nation’s largest miniature golf courses, Dinosaur Adventure Golf features two 18-hole courses: "Raptor" and "T-Rex" (A Total of 36 Holes); 3 distinct decorative ponds with fast-moving rapids and bubblers; and a 50 foot high “active” steam-erupting volcano that lets golfers play directly through a realistically eerie, cavernous volcanic interior on their way to the 18th hole. A walk through Movieland is a like a walk-through entertainment history. Snap a selfie next to your favourite stars! You'll see everything from classics like "Indiana Jones" and the "Terminator", to current hits like "The Hunger Games" and "Pirates of the Caribbean". For those brave enough, you can visit the optional “House of Horrors” at the end of your Museum tour, it’s one of the most hair-raising horror chambers you’ll ever experience...if you dare! Have a seat on a surprise waiting for you for an "electrifying experience!" The Wild West Coaster 6D motion ride (former XD Theater) takes visitors on an amazing adventure that transcends time, space and imagination. Visitors will enjoy the Wild West Coaster's broad range of motion, which can go from gentle murmurs to intense trembles, making the ride far more real; transporting audience members directly into the movie action with every effect amplified and pushed to its limit, creating a unforgettable experience like no other. Just imagine being whooshed up into a wild ride on a massive screen where you're lifting and turning and moving and twisting into elaborate scenery. There`s no better way to experience the action. It’s fun! It’s wild! But best of all, when you’re moving with the scenery it feels like you're in that movie on that coaster in the heat of the action! theme called Ghost Blasters Dark ride. This cool interactive “black-light” adventure has many different animatronic characters. Your adventure begins by entering the Bleakstone Manor where you'll be confronted by an army of ghosts, skeletons, ghouls and goblins riding from room to room in velvety black-light darkness. Lucky for you, you'll have a laser gun to blast away these pesky phantoms that seem to pop out from every crack and crevice....and if you’re up for the challenge you can try to get the highest score by blasting away ghosts with the most accuracy. Are you ready for a unique sightseeing opportunity with breathtaking views of the Falls and beyond? Then head on down to Clifton Hill and take a ride on Canada’s largest observation wheel, the Niagara SkyWheel. Towering 175 feet (53 metres) over the Niagara Falls horizon, the Niagara SkyWheel is the newest, most exciting way to see Niagara Falls. Since 1964 we have carried on Ripley’s tradition of scouring the globe for unbelievable exhibits. Experience our biggest update to the Ripley’s Believe It or Not! Everything in the Odditorium is completely new. Visit Ripley’s Believe it or Not Odditorium with more than 15 themed rooms and over 900 never-before-seen-exhibits. Louis Tussaud’s invites you to mingle with the stars of yesterday and today. This incredible attraction will leave you speechless! The stunning, English Tudor style building, houses well over 100 true to life wax figures that you can actually touch and feel in 16 spectacularly themed galleries. Come take a selfie with your favorite star! Louis Tussaud’s Waxworks is a collection of instantly recognizable, true-to-life wax figures crafted by recognized wax artists from around the world. Nothing behind glass!